The Kamov Ka-8 (Irkutyanin) was a tiny Soviet helicopter that first flew in 1947. It was a precursor of the Ka-10. 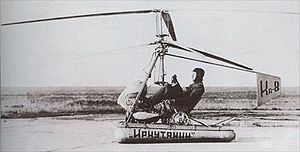 The Ka-8 was a single-seat helicopter with a 27hp M-76 engine, boosted to 45hp by using alcohol for fuel.